Each of you will have a 35 mm dish of mouse embryonic stem (MES) cells that you will use to seed a six-well dish. You and your partner will seed the dishes at different concentrations so you should decide who will seed at 1:10 and who will seed at 1:2. We will begin with a brief demo about sterile technique and how to use the tissue culture hoods. Waste disposal, preview: Pasteur pipets, pipet tips, and small conical tubes can go directly into the sharps mayo jars. Please set aside serological pipets, large conical tubes, tissue culture dishes, and gloves/papers; periodically put them in the benchtop biowaste containers or directly in the burn box. Each tissue culture hood is partly set up for you. Finish preparing your hood according to the demo, first bringing in any remaining equipment you will need, then picking up the pre-warmed reagents from the water bath. Don't forget to spray everything down with 70% ethanol. One of the greatest sources for TC contamination is moving materials in and out of the hood since this disturbs the air flow that maintains the sterile environment inside the hood. Anticipate what you will need during your experiment to avoid moving your arms in and out of the hood while your cells are inside. Look at your cells as you remove them from the incubator. Look first at the color and clarity of the media. Fresh media is reddish-orange in color and if the media on your cells is yellow or cloudy, it could mean that the cells are overgrown, contaminated, or starved for CO2. Next look at the cells on the inverted microscope. Note their shape and arrangement in the dish and how densely the cells cover the surface. Aspirate the media from the cells using a sterile Pasteur pipet. Dip the pipet in your beaker of ethanol when needed (to clean it). Wash the cells by adding 2 ml PBS using a 5 mL pipet. Slightly tip the dish back and forth to rinse all the cells, and then aspirate the liquid. To dislodge the cells from the dish, you will add trypsin, a proteolytic enzyme. Using a 2 ml pipet, add 0.7 ml of trypsin to the flask. Be careful not to pull up liquid too quickly or it will go all the way up your pipet into the pipet-aid! Tip the flask in each direction to distribute the liquid evenly. Incubate the cells at 37°C for 3-5 minutes, until the cells round up and are easily dislodged from the plate by tapping. While you are waiting, you can add 1 ml of sterile 0.1% gelatin to the two leftmost wells of a six-well dish (one dish per pair) and also label the dish. The gelatin will be removed before you seed your MES cells but it is important to pre-treat the dish this way. MES must grow on either a "feeder layer" of fibroblasts, or on a gelatin-coated surface. The pre-treatment must be done for at least 10 minutes. Label the plate lid with your group colour, today’s date, and the cell line (called “J1”). Label the well you used with your initials and the cell dilution you did, and make sure your partner does the same. After retrieving your cells, add 1.3 ml of media to the trypsinized MES cells and pipet the liquid up and down (“triturate”) to remove the cells from the plastic and suspend them in the liquid. Remove a small amount of the suspension (perhaps 50 μL) to an eppendorf tube. According to the procedures below, either begin counting your cells or begin plating them (no matter what count you get, you will plate a 1:2 and a 1:10 dilution), depending on microscope availability. The teaching faculty will explain cell counting to 1-2 groups at a time. Take your cell aliquot to the inverted microscopes and fill one chamber of a hemocytometer with 10 μL of the cell suspension. Note that different squares are sub-divided into different grids. Very dense cells could be counted in the fine grids. In your case, the 4x4 grids and a 10x magnification will be most convenient for counting. 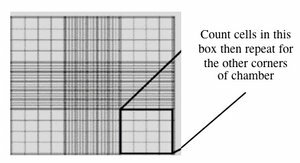 You should count the cells in two of the four corner squares of the 25 square grid, then average the numbers to determine the concentration of cells in your suspension. Save your raw data for a later FNT assignment! You and your partner will each seed 3 mL of cells but at different concentrations. Decide if you will try the 1:10 or 1:2 dilution and mix the appropriate amount of cell suspension and culture media together in a 15 ml conical tube. Remove the gelatin from the six-well dish (if you haven't already) and add 3 ml of your cell dilution to one of the gelatin-treated wells. Your partner will use the other treated well in the same dish. Be sure to label your plate if you haven't already, then return your cells to the incubator. Waste disposal, final: Aspirate any remaining cell suspensions to destroy them and then clean up the hood. Dispose any vessels that held cells in the burn box, and any sharps in the mayo jars or burn box according to the waste disposal preview above. The next group who uses your hood should find the surfaces wiped down, no equipment that you brought in left inside, and the sash closed. Please do leave the equipment that was already there. This page was last edited on 18 April 2013, at 07:25.